The other day I was browsing design blogs at home and I came across one picture that caught my attention. It wasn’t particularly good, but it was very meaningful: two photos of two different children, one of them carrying a little bird very carefully in his hands, and the other one with the same care was holding a smartphone. A message underneath said: ‘Educate your children to value what is really valuable’. 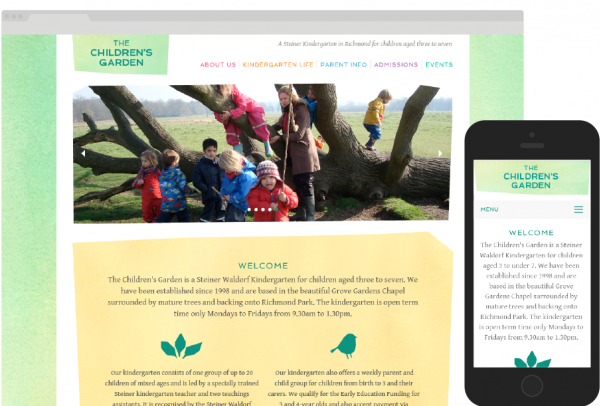 This took my memory back to the project we volunteered to do last September: a website for The Children’s Garden, a Steiner kindergarten based in Richmond, London. 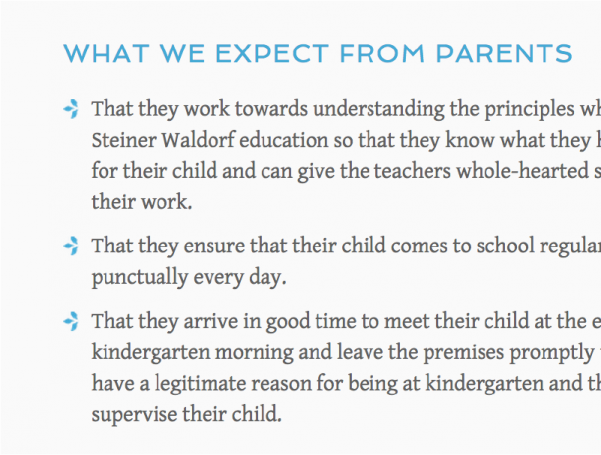 Steiner kindergartens are schools that follow the doctrine of the Austrian thinker and architect Rudolf Steiner. They are characterised by a holistic approach – the child has to develop their moral, spiritual and creative skills as much as their intellect. The parents are asked to limit the children’s exposure to computers, television and video games so they can spend more time interacting with the real world and developing a creative mind. The classrooms only have objects made of natural materials such as wood, where children can develop their imagination, sense of beauty and respect for nature. Play and artistic activity are considered essential for the child’s learning process, often not led by a teacher. So this project had a lot of story behind it to start with. 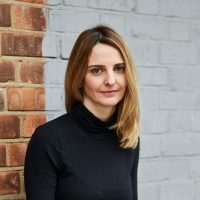 The website was aimed at attracting local parents to the school, set in a beautiful old church on the edge of Richmond park. 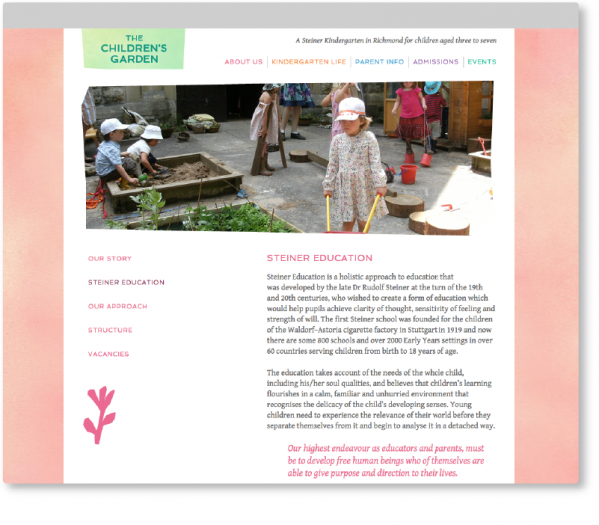 To be coherent with Steiner’s approach, the style of the whole website needed to be welcoming, colourful and organic. Also, it had to be fully responsive and SEO friendly. 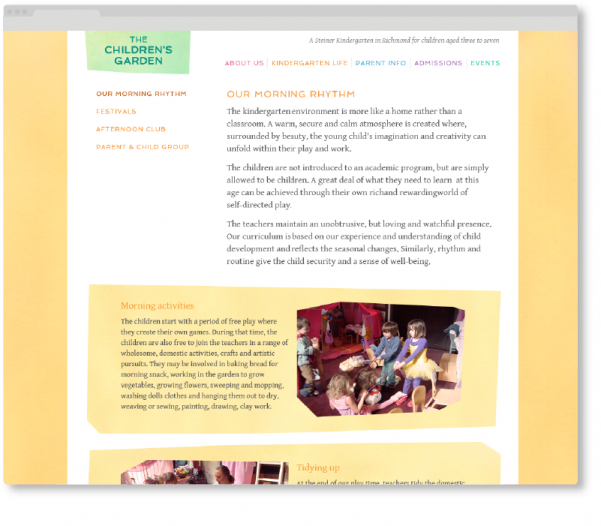 The backgrounds of the website are real two-tone watercolour washes, that give a calm and pleasant sensation to the user, the same as the children when they are in the classroom. 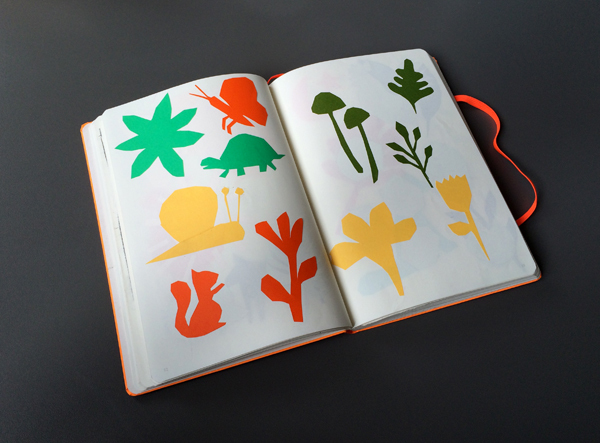 The illustrations are cut-outs based on the wildlife children could discover in the woods nearby, that were scanned and digitalised afterwards. I remember being inspired by Matisse, who was exhibited at that time at Tate Modern (I hope you didn’t dare to miss that beautiful exhibition). 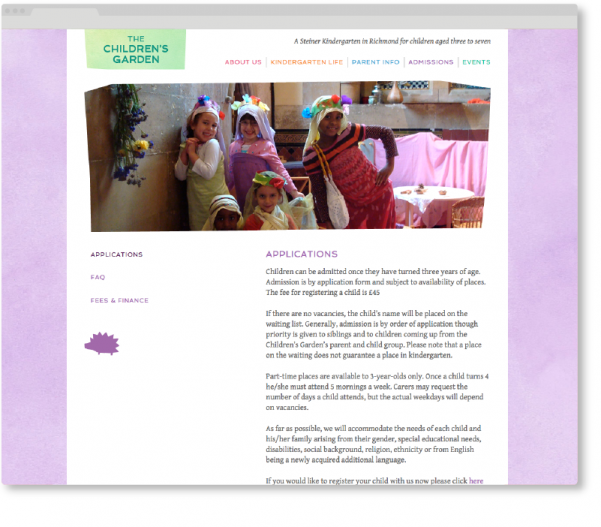 As a voluntary project we had to be aware of the costs, so we used Google fonts. It has a limited library selection but specifically for this project, we found a pair that really matched with the style of Steiner.  Gentium Basic, a bookish readable serif was chosen for the body copy, and the wide Spinnaker for the headings and logo, which has a sort of organic playfulnes that enhances the spirit of these kindergartens. All the pictures and text boxes have irregular shapes, imitating Steiner’s organic architecture style. 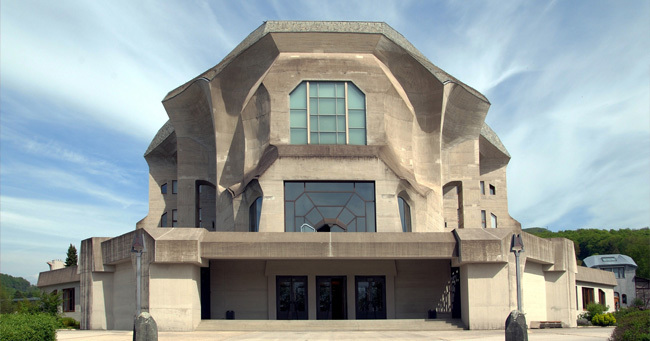 Overall, we’ve designed an accessible website, easy to populate and update, that reflects the doctrine of Rudolf Steiner. A school where children are allowed to be children.